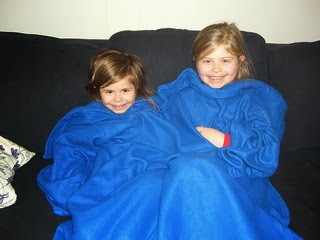 A Snuggie is just a big fleece blanket with sleeves, so they really can't be that hard to make. I found some great free patterns to make your own! Welmoed's Sewing Room has created a PDF how-to for sewing your own fleece blanket from 3 yards of polar fleece. You could go to a second-hand shop, buy a blanket for real cheap and make one or more of these! Snuggies are great and help you to say warm. The patterns can be good because you can use thicker material to say even warmer. May the Snuggie force be with you all!